How smart or stupid is your country? I.Q. or Intelligence Quotient is a score derived from one of several standardized tests designed to assess human intelligence. Like most natural human attributes, such as height, weight, or beauty, intelligence as measured by IQ tests falls into a normal distribution or bell-shaped curve, wherein the average (mean, median, and mode) score bisects the population into two equal halves, with most people clustering at or around the average, and few people in the curve’s two extreme ends. 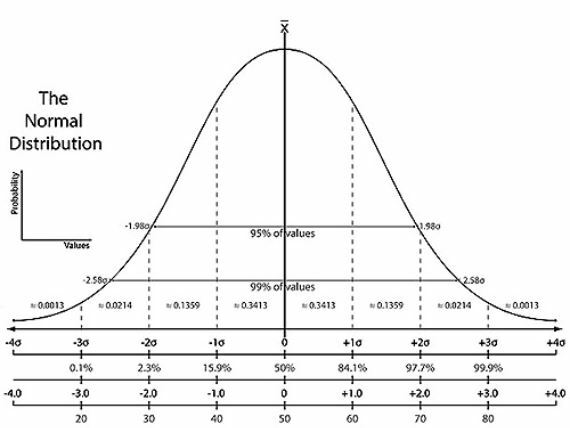 The normal distribution curve can be divided by standard deviation (SD) units up or down the curve. Tthe average raw score is 100. Each SD unit is comprised of 15 IQ points. Approximately 95% of the population have an IQ between 70 and 130, which is within two standard deviations ± of the mean. An IQ score of 145 is considered to be genius-level because, as you can see from the graph above, such an individual has an IQ that’s very rare. Only 0.1% of the human population have an IQ higher than 145; or, put another way, if your IQ is 145, you are more intelligent than 99.9% of humans. In contrast, individuals with IQ of 70 or below are severely cognitively challenged. In non-politically correct terms, they are morons (IQ of 51 to 70), imbeciles (IQ of 21-50), and idiots (IQ of 0 to 20). Please make a note of this. To convert a raw IQ score into a percentile ranking, click here. IQ scores have been shown to be associated or correlated with such factors as morbidity (health and disease), parental social status, and biological parental IQ. The inheritability of intelligence is politically controversial because the average IQ of certain racial groups — blacks (in the U.S. and even more in Africa), “native” Americans, and Hispanics — persistently are found to be lower than the human population average of 100. The consensus among scientists is that heredity and environment account for about 80% and 20%, respectively, of human intelligence. While IQ is not a perfect measure of human intelligence (as if any measure is), IQ scores have proven to be good correlates and predictors of educational achievement, special needs, job performance, and income. Subsequent research work by Dutch psychologist Jelte Wicherts. The average IQ of No. 43: Equatorial Guinea is 59, which means the average Equatorial Guinean is a moron (IQ of 51 to 70). Let that thought and its implications sink in . . . . I cannot emphasize enough that the above IQ scores are national AVERAGES, which means the scores are not representative of EVERYONE in those countries. There are intelligent and stupid people in every country and every race — which is why we should never generalize from these average IQ scores to INDIVIDUAL members of a country or race. Instead, we should treat everyone we meet as INDIVIDUALS, not as members of some race or country. Lastly, many years ago I learned a very important lesson from the department secretary of the university in which I was teaching. She was not the brightest bulb: I estimate her IQ to be slightly below the population average of 100, probably in the 90s. But she was kind and sweet, a loyal friend and a genuinely good soul. The lesson I learned from Kathy is that intelligence is greatly overrated. If I had to choose, I will always pick virtue over a high intelligence. In fact, there is no one as dangerous and lethal as a highly intelligent but evil person. After all, Adolf Hitler no doubt was highly intelligent. Whatever your IQ is, it was a gratuitous gift from our Creator. What is important is not how gifted we are but what we do with the intellect and intelligence He so generously gave us. Just remember the Parable of the Talents (Matthew 25:14-30): To some He gave great intelligence and many talents; to others, He gave only a few. But each of us, whether genius or imbecile, one day will be called to account for what we did with the talents we were given. This entry was posted in Bible, Christians/Christianity, Education, God, God's creation and tagged average IQ of countries, inheritability of intelligence, Intelligence quotient, IQ normal distribution curve, IQ scores and percentiles, Jelte Wicherts, Matthew 25:14-30, Parable of the Talents, predictive value of IQ scores, racial differences in IQ, Richard Lynn, Tatu Vanhanen. Bookmark the permalink. That was a phenomenal posting! You are so right, a righteous heart beats out high intelligence every time. Reblogged this on Blogul lui Popa Țeapă. I appreciate what your point is; and count myself to be truly blessed to live in a country as blessed as this is. What I couldn’t help but notice is this: if I were running a country, I would try to attract as many people from the top of the list as possible while limiting severely the opportunities for people from the bottom of the list. This would ensure that my country imported the brightest and most capable. Now I ask you…which half of this list does our government seem to want to attract? Thank you Dr. Eowyn for this most noteworthy post. Thank God that Our Lord does not require great intelligence to be holy. I want no more Italian jokes! Hear what I am saying, everybody from Iceland to East Guinea. Sorry to try humor in such a serious subject needing your posting, but I am from one of the countries in the greater mass of humanity beneath Italy.